Home / Uncategorized / The Creepy Bridal Doll – 1 year later. ITV This morning famous haunted doll. The Creepy Bridal Doll – 1 year later. ITV This morning famous haunted doll. The doll what started the trend of haunted items in 2017 is back one year later!. 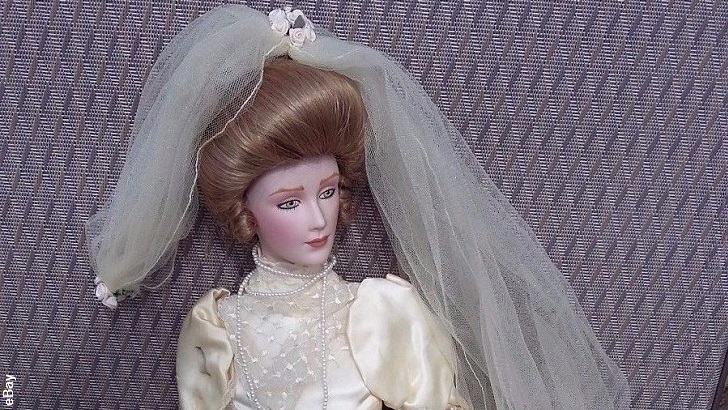 People say the famous bridal doll is responsible for the current haunted item interest today. but what is she upto now? The most recent update is that we decided to take the bridal doll to a para convention called fearcon ran by trisha. the doll was not! locked away for a good year, and i wanted to do something different new and fresh. ! so i thought up of an EXPERIMENT CALLED. which is Latin for the spirit cabinet, but designed for haunted items in mind. the first of its kind. pushing the boundaries of paranormal research. A cabinet where you place the subject inside, flood it with smoke. and ask the spirit to show it self. while taking photos. also within the cabinet is different spectrum’s of light emitting to also help the different wavelengths of vision, and a strobe light to slow down our vision to further your chances to maybe see something we struggle to see naturally. we decided to do a live feed a couple of days after the live audience experiment in wales. 1000s of people tuned in to watch the bridal doll again on their live screens. and we decided to try some ITC. we asked where the doll has been. and it said IN THE BOX. we then asked it to effect the people watching, we asked if is going to do something and all of a sudden we had a massive out burst of people saying they have uncontrollable itching. 42 people to be precise reported it. its a new reporting associated with the doll. obviously we cant say it is the doll. but what we can say is its happened within the presence of the doll. was this mind over matter, was this a contagious reaction programmed in peoples mind which caught their imagination we dont know. but its interesting! Or was it me implanting it by asking people for permission to be strached. We will be working again with the bridal doll next week on ghosts of britain so keep posted! and keep watching! Next post: Ghost Adventures Meet Annabelle’s Curse.